If your Lab still has seizures while taking phenobarbital, ask your vet about adjusting her medication. 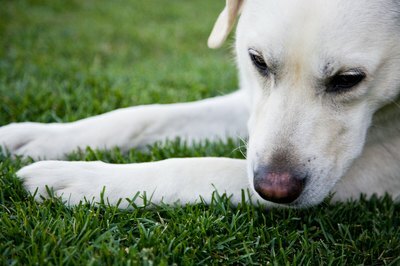 Watching your Labrador have a seizure is unnerving, especially if she seems frightened or unresponsive. Phenobarbital is a sedative commonly used to treat genetic seizure disorders in Labradors and other breeds. Phenobarbital won't cure your Lab's disorder, but it can decrease seizure frequency and help your pup live normally. Epileptic seizures are caused by an electrical misfire in the brain, but the exact source of the problem can be difficult to confirm. Usually, canine epilepsy is idiopathic, or without a known cause. Phenobarbital is the most common treatment for idiopathic epilepsy. It is usually taken twice a day, in pill or liquid form. Your pup's dosage can be increased over time if necessary. Phenobarbital can also control your Lab's seizures if she suffers from Exercised Induced Collapse (EIC). This hereditary syndrome found predominantly in Labs looks like epilepsy, but it is triggered by over-excitement, strenuous exercise and extreme heat or humidity. Phenobarbital can reduce anxiety and lower the risk of EIC. About 25 percent of Labs carry the gene for EIC, according to the American Kennel Club Canine Health Foundation. Labradors of all colors are affected by the syndrome but it is most prevalent in black male dogs. EIC can be diagnosed by testing your pup's DNA to see if she carries the gene. Phenobarbital can make your pup a little woozy or sleepy as she builds a tolerance for the drug. Since Phenobarbital can increase her hunger and thirst, you may notice that she begs for extra helpings or empties her water bowl more often. You will need to watch her diet so she doesn't overeat and give her plenty of opportunities to relieve herself. Long-term use of phenobarbital can cause liver damage, so your dog should have blood tests at least once a year to test the level of medicine in her blood. Potassium bromide, one of the first drugs to treat epilepsy in humans, also can be used to calm seizures in your Lab. Potassium bromide isn't as hard on the liver as phenobarbital, but it is also less effective and slower in stopping seizures. The drug Diazepam, also known as Valium, can also halt seizures but becomes less effective with repeated use. Seizures that are caused by a brain defect, tumor or abscess, may be eased through brain surgery, according to the American College of Veterinary Internal Medicine. If your dog is suffering extensively from seizures, ask your vet to recommend a a veterinary neurologist, a specialist who treats epilepsy and other diseases of the nervous system. What Causes Seizures in Chihuahuas?